"My friends say I'm like a plumber, because I'm always doing this," says David Perlman, owner of Fountains by Design in his rustic studio in the foothills of the Colorado Rockies. Perlman grabs a piece of pipe from his worktable, inserts it into a pipe-cutter, and whirls the cutter around the copper pipe. "This is what plumbers do," musing that he probably could be a plumber. Luckily he doesn't have to. His sculptures and fountains have gained a following among clients ranging from major corporations like Whole Foods to everyday people who fall in love with his unique pieces and want one in their home or garden. Perlman feels fortunate to make a living as an artist. "Even when there are bumps-and it's been pretty tight sometimes-nothing compares to being able to connect with people through what you create," he remarks. Watching Perlman in his studio, trailed by his beloved dogs as he heats up the metal fittings for his latest piece, he does seem to be in his element, like he's been doing this forever. But it turns out Perlman arrived at his vocation rather late, and more through serendipity than calculation. A former sociologist, he happened to meet successful Dutch sculptor Hans Van De Bovenkamp-it was a relationship that changed his life. "I got to know Hans and he invited me to watch his process," he recalls. "I saw what his assistants were doing, and I said, 'I want to do that.' At first, he told me that kind of work took years of training, but I persisted and actually began working as his assistant. Turned out I had a talent for it. So my training, my love for copper, most of what I know now, started with Hans." 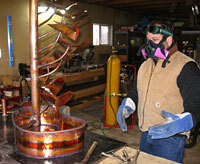 Perlman, who has been working solo for ten years, is best known for his copper fountains. These surround us as we talk in his studio this chilly November afternoon. Some are blindingly bright and polished, others weathered into the famous patinas that make copper so distinct from other metals. He prefers copper because of its unique qualities, tying in the metal's Feng Shui, healing and symbolic attributes to name a few. He wouldn't think of using anything else, even though the current economic climate is tough and the price of copper has gone up. Purchasing his copper from Ryerson, a major distributor in Denver, Colorado, Perlman creates everything from stock fountains to elaborate custom installations. Most of what is in the studio this day is stock, and also some prototypes for some large-scale public works. Perlman gestures toward one copper fountain, a design with spiraling leaves in an organic curve: "This one is the Tree of Life, probably my trademark fountain." Another favorite design is the Water Shrine, whose modest symmetry showcases the copper material. Its simplicity is effective in a range of sizes from extra small to jumbo. And, there is the Metropolis, a striking, impressionistic cityscape, also producible on a large scale-a project he did for Whole Foods in Pasadena, California. Overall, Perlman's present mood is one of confidence and optimism. After ten years, he's coming into his own and finding an even stronger creative voice. He is negotiating to produce several large-scale fine art projects as well as working on some new fountain designs. When asked if he will need a bigger studio, he looks around and grins. "Maybe," he says. "With room for what I'm working on and room for the dogs to hang out."